AFC - 04/28/15 Each Life Is Precious! - Accompanied by the dogs they rescued, volunteers appear on billboards all around Croatia. 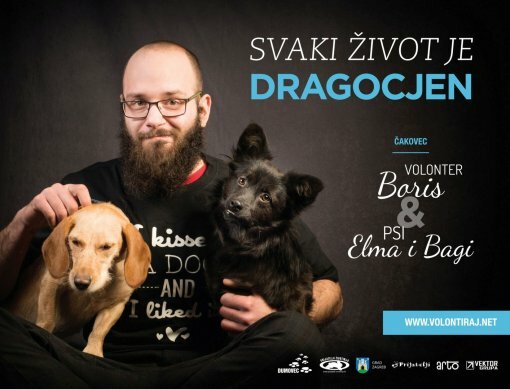 Dumovec Shelter for the Abandoned Animals of the city of Zagreb has launched the campaign called "Each life is precious!" 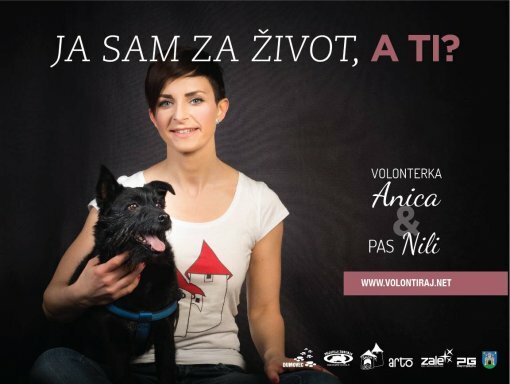 in cooperation with Animal Friends, which includes the following no kill shelters: Animal shelter Virovitica - the Laki Association, Animal protection organization "Sapa" from Bjelovar, abandoned animals' shelter of the Association Victories from Osijek, Animal shelter of the association "Spas" from Varazdin, and Animal shelter "Prijatelji" from Cakovec. By firmly stating "We are in favour of life, and you? ", the volunteers invite others to provide a home for animals instead of killing them. The campaign will be accompanied by the hip-hop musician IFEEL's music video "Nove pobjede" (New Victories). There are only six no kill shelters in Croatia, which is a sad statistical fact considering the total number of shelters in Croatia. 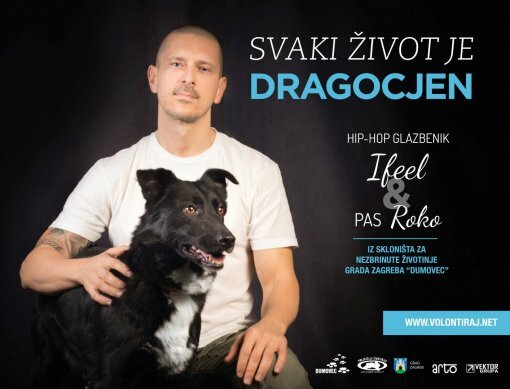 The citizens of Zagreb, Cakovec, VaraZdin, Bjelovar, Virovitica and Osijek have recognized the importance of these institutions in their city, and thousands of animals have been rescued and found a home in this way. Yet still, new animals keep arriving to the shelters, and additional effort, determination and work are required to bring awareness of the citizens' responsibility for the animals they foster. 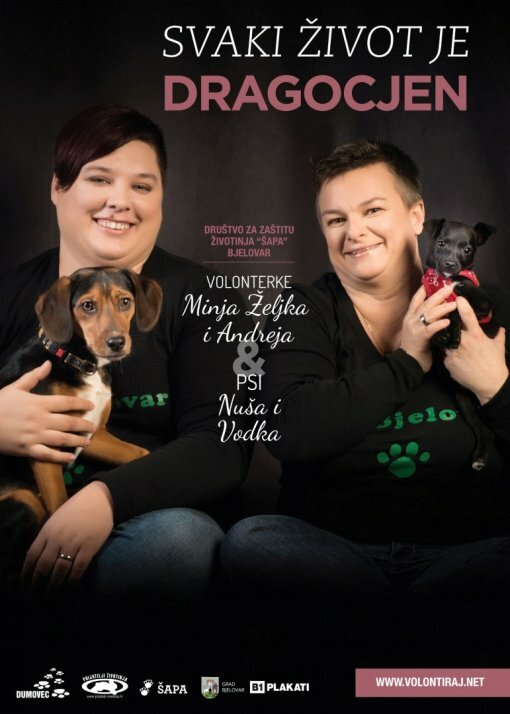 The message that volunteer work is very important and socially acknowledged activity which saves lives as in the case of finding homes for sheltered dogs, is also being put across by the campaign. Except providing a home, help may be provided by signing the petition for the legal prohibition of killing sheltered dogs, by providing a temporary home for animals awaiting a permanent one, advertising animals in need of a home, distributing flyers and other informational materials, helping animals in shelters, and in other ways. The no kill shelters are open to citizens and volunteers, and the everyday kindergarten and primary school visits as well as finding homes, are a result of sustained education of children and adults on pet care. The petition in favour of the prohibition of killing sheltered dogs and other information on advertising and providing a home to animals may be found at: www.prijatelji-zivotinja.hr, and the visuals and video materials as well as the description of how anyone can join the campaign may be found on this web site: www.volontiraj.net.